The result of a Senate committee's long-awaited review of media-based ministries has finally been released. 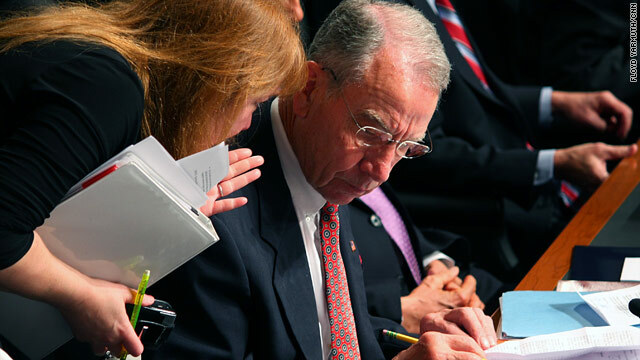 Sen. Chuck Grassley, R-Iowa, began the investigation into six televangelists in November 2007, when he was head of the Senate Committee on Finance. His office released the review Thursday. At issue was compensation for the pastors and ministry leaders who openly led lavish lifestyles while their ministries received tax-exempt status from the Internal Revenue Service. The review by the committee did not impose new rules on the religious organizations or suggest they be stripped of their tax-exempt status. But it did bring to light compensation practices that may raise eyebrows in the non-profit community and lead to a discussion of new tax policies for religious organizations. "The staff review sets the stage for a comprehensive discussion among churches and religious organizations," Grassley said in a prepared statement. "I look forward to helping facilitate this dialogue and fostering an environment for self-reform within the community." Of the six organizations targeted by Grassley's review, only Joyce Meyer Ministries and Benny Hinn of World Healing Center Church participated fully. The review states both groups were working to reform their ministries' financial practices. Committee staff members Theresa Pattara and Sean Barnett wrote in the staff review, "The reforms undertaken by Pastor Hinn and Joyce Meyer are extensive and are to be commended." Joyce Meyer Ministries, based in St. Louis, went so far as to join the Evangelical Council for Financial Accountability. The other ministries in the review did not participate fully or at all, the senator's office said. The review and correspondence released by Grassley's office shows Randy and Paula White of Without Walls International Church, Eddie Long of New Birth Missionary Baptist Church, and Kenneth and Gloria Copeland of Kenneth Copeland Ministries submitted incomplete responses to the senator's questions. Atlanta-based Creflo and Taffi Dollar of World Changers Church International/Creflo Dollar Ministries did not participate at all, declining the senator's requests, according to released correspondence between Grassley and Dollar's attorneys. Long responded in a statement Thursday night, "I am relieved that after more than three years of intense investigation and countless untrue allegations, that Senator Chuck Grassley's review has found no evidence of wrongdoing. Our ministry at New Birth has always and will continue to operate with accountability and integrity. I am thankful to God that the public now knows the truth." Where churches would not participate, the review says, the investigators declined to issue subpoenas, instead relying on public records, court testimony, and even confidential informants. According to the review, many of the ministries operate multiple non-profits, with the leaders drawing some form of compensation from each of them. "The number and types of entities, including private airports and aircraft leasing companies, raises concerns about the use of the church's tax-exempt status to avoid taxation. However, given the four churches' refusal to provide tax information, we are unable to determine whether and the extent to which they are reporting and paying taxes on income earned in those entities," the review states. The review praised the broader religious community in the United States and noted there are a few bad apples that may lead to a discussion of a new tax law for religious entities. "While the majority of churches and religious organizations operate with policies and procedures that make them accountable to their members, it is the small minority that don't that are subject to scrutiny by the members and the public, including the press. These outliers present tax policy issues for consideration," the review said. Churches have long had a strange dance with the IRS. The government has to balance the constitutional rights of the churches under the Establishment Clause and the groups' rights to free speech. The review notes tax laws relating to churches have not been updated in decades. Because the ministries are incorporated as houses of worship, they are exempt from filing the financial disclosures the federal government requires of other non-profits. "The challenge is to encourage good governance and best practices and so preserve confidence in the tax-exempt sector without imposing regulations that inhibit religious freedom or are functionally ineffective," Grassley said. FSM lives and boiled for your sins. I believe the answer to that, would be for the mortgage brokers and mortgage bankers to give more then what the big banks are giving to the public and to the real estate industry. It's a simple philosophy give and you will get much more in return. We have set our path for 2011 strategy and the execution of our strategy will begin in January 15th of 2011. Our strategy will create opportunities for real estate agents to have more business and develop for them a strategy for continuous growth in return to have a massive bonding strategy between the real estate agents in our market with our loan officers in exchange for the value that is provided by the services and the strategies we bring to our industry. All we would like to ask for the loan officers, the mortgage brokers and mortgage bankers that are in the industry and they are facing some financial trouble or facing frustration of growth and development for their office or their company to join us on Facebook and join our company so we could put our hands together and promote what banks can't promote, give the public and the real estate industry something that has never been provided and asking nothing in return. Our formula for success in 2011 is the way of conquering markets, it's the new way to conquer this industry lets come together and turn this industry to our benefit and show the banks how hard it is going to be for them when we are taking their business away, and how much this industry is in a need for our breed of professionals. Have you ever read such hateful comments? And these are from people who claim to be atheists. Maybe you could use a little Jesus in your heart to calm yourself down. They spew hate and bigotry as they claim to be "more enlightened". Interesting and sad. No dear sir! The church MUST answer to the people! Living in a lap of luxury while their flock lay bare is wrong and not the word of Jesus. You may take this as "hate" but it is reality. The party must come to an end for once. Funny. I didn't read the comments, just the article, and I find the actions of many of these so-called "christians" to be criminal. Do you care to address that, Paul? Why do you feel the need to attack atheists, when the article covers the less than scrupulous actions of believers? Are you trying to deflect? Jesus is the sun. Let the sun shine in. Jesus Christ was a fabrication of the Romans to keep the pee-ons enslaved.